This is one of Japan's main traditional theatre forms. It is said to have been developed around 1603 when Okuni, a shrine maiden of the Izumo Taisha, performed “nenbutsu odori” (Buddhist folk dances) in Kyoto. These were very popular, but an all-female Kabuki troupe came to be outlawed as corrupting public morals. Hence, subsequent Kabuki performances were enacted by males only. Later, those performances gradually acquired artistic standards and were perfected as a comprehensive art form that brought together various disciplines of theater, classical Japanese dance and music. 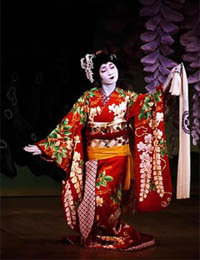 Kabuki is principally characterized by distinctive features such as men acting in female roles, usage of elaborate stage makeup and other inventions such as Kabuki stage equipment. After the Second World War, there were numerous performances in Europe, Asia, the United States and various other places. Research organizations comprising Western scholars, such as the European Kabuki Conference and Japanese Theater Research Centre, were established. The terms “Fujiyama” and “Geisha” were, until recently, stereotypical expressions used by people who were unfamiliar with Japan to express their thoughts regarding the mysterious oriental island country. The reason the term “Geisha” became famous is perhaps that the gentle and thoughtful manners of the Geisha deeply impressed Western men. However, now it should be regarded as an expression of ignorance about Japan. 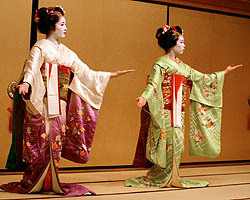 Geisha are women who make it their profession to provide entertainment for banquets. They do up their hair in the Japanese coiffure, go to traditional inns and Japanese-style restaurants while wearing kimonos to sing traditional songs, play the shamisen and perform classical Japanese dance. There was a time when they were also prostitutes, so their sexual image is strong, but now the tendency is to regard them as working in a valuable profession that preserves the heritage of traditional arts. Japanese gardens, as compared to Western gardens which are laid out geometrically, are designed with an emphasis on the natural view. They are mainly imitations of the natural world, with heaped-up earth likened to mountains, ponds to oceans, and flowing water to rivers. Some also incorporate a tea garden with stepping stones and places to sit. 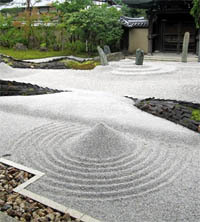 In addition, the dry landscape garden is a typical style of Japanese gardens. This refers to a garden that expresses landscapes without water, only with rocks and sand. Hills and waterfalls are expressed by rock constructions and rivers are expressed by making lines on white sand spread out on the ground with bamboos to depict water flowing. In the Muromachi Period (1333 – 1573), such gardens were influenced by landscape paintings imported from China, and many were designed as entry-way gardens for Zen temples. The Japan Archipelago, encircled by water, abounds in marine products. Fish in particular is essential to the Japanese diet. 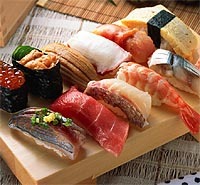 As fresh fish is easily obtainable, dishes that are eaten raw, such as sashimi and sushi, are popular. In addition, grilled or boiled cooking style is widespread, but steamed or fried dishes as in Western cooking, are relatively not so. Fish is deeply related to Japanese culture. When a sea bream is grilled whole, it is considered good luck and is invariably served on grand occasions such as weddings. Shrimps and prawns are considered good luck as well because in a figurative sense, the more their tails are curved and their backs bent, the longer one's life will be. 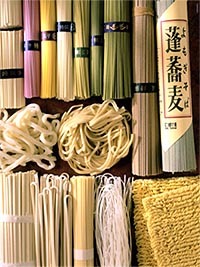 There are two kinds of traditional noodles: Udon and Soba. Udon is made of wheat flour and is widespread principally in Western Japan, including Kyoto and Osaka. Soba (buckwheat) comes from a plant relatively easy to cultivate even when the weather is cold or the soil has worn thin; the grain of this plant is made into Soba flour, then kneaded, finely cut, and cooked for eating. It is relished mainly in Eastern Japan, including Tokyo. Both dishes are prepared in a hot soup together with various ingredients. In summer, the noodles can be dipped in a cool broth and eaten. In recent years, a Chinese brand of noodle know as Ramen, when prepared Japanese style, has rapidly permeated the Japanese sense of taste. Instant Ramen, in particular, in only a few decades has captured the national fancy. It is now sold all over the world as a kind of “Japanese noodle soup”. There are two kinds of Futon: sleeping mats and coverlets. Futon are filled with cotton or feathers. Sleeping mats, like bed mattresses, are covered by sheets, while coverlets are used with blankets as coverings. Since Japan is quite humid, Futon are hung out on sunny days to air in the sun. 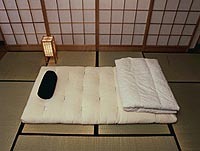 As Futon are put in a closet called Oshiire when not being used, they serve as practical bedding for small Japanese rooms. 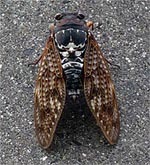 Semi (cicadas), as well as butterflies and dragonflies, are insects which are familiar to the Japanese people. When summer arrives, these insects start to sing together on trees in mountains and villages. Where there are many cicadas, the mixture of sounds becomes like a drone, which is referred to as “semi-shigure” (shower of cicadas). This word is often found in haikus (poems comprising seventeen syllables) and other poems. 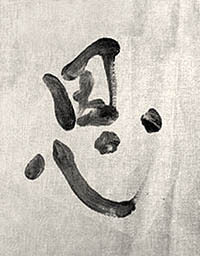 There is a famous haiku on semi-shigure by the great master of haiku, Basho. Since cicadas, which lie dormant in the ground for several years as larvae after birth, die only a week after finally coming up to the surface, their lifespan is often compared, along with Mayflies, to the transcient life of human beings. 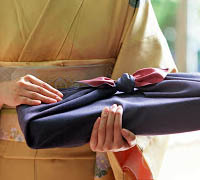 Giving a gift in return is called Okaeshi. In Japan, the custom of exchanging gifts remains strongly entrenched to preserve the harmony of human relationships. There are general standards regarding when and how both to give gifts and give gifts in return. Gifts are sent to commemorate auspicious events, at times of mourning, at mid-year and at the end of the year. In accordance with customary practice, those who have received gifts do send other gifts in return. By receiving gifts and sending gifts in return, human relationships are strengthened. A person receiving gifts without reciprocating is regarded as being ignorant of his/her moral obligation. 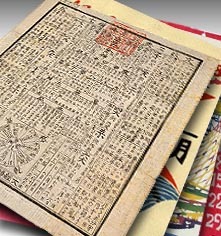 Until the current solar calendar was adopted in 1872, life in Japan was based on the “lunar solar calendar.” While this is a calendar created principally according to the phases of the moon, it aligns itself with the four seasons brought about by the revolving sun and is generally called the lunar or old calendar. Thus between the era of the old calendar and now, there is a difference of nearly one month, and some regions still carry out events such as those of New Year and the Bon Festival based on the old calendar. Also, to express the change of seasons on the calendar, there are 24 occasions such as the first day of spring, the summer solstice and the period of the second severest cold. Based on these, the Japanese change attire and prepare to welcome the seasons. The six days that determine good fortune - days of good and bad luck - are repeated every six days, and the Japanese people set dates for weddings and funerals in accordance with them. In Japan, chestnuts are one of the most common and beloved tastes of autumn. Together with persimmons, they symbolize autumn. The outermost shell covering the fruit of the nut is full of prickles, like a hedgehog. 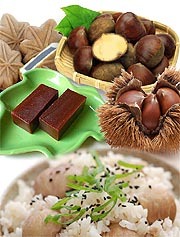 These nuts can be eaten boiled or cooked with rice to make chestnut rice. They are also used as ingredients in Japanese snacks such as sweet bean jelly (Yokan) and buns with a bean-jam filling (Manju). A debt of gratitude is the social and psychological obligation taken on with favours received from others. The word 恩 is derived from a warrior society when lords granted land to followers. Japanese society has a history of only about 130 years since shedding its feudal system. At present it is still fundamentally a vertical society, which values strict order and strong relationships among people of different ranks. This means an inclination for socially superior people to often take care of their subordinates in both social and personal matters, and, in return, the subordinates, feeling a debt of gratitude toward their superiors, pay them respect and render them loyalty. To forget the debt of gratitude received from others is morally inexcusable. However, this kind of sentiment, as well as others considered to be traditional Japanese feelings, is gradually diminishing. 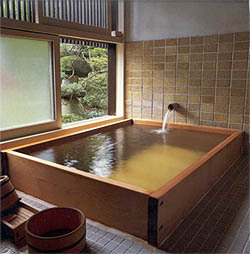 In taking a Japanese bath, one enters the bathtub only after first washing off outside the tub. Generally, the whole family uses the same tub of hot water, so they keep it clean. Until about 40 or 50 years ago, bathtubs made of wood were common, but now they are almost all made of tiles, plastic or stainless steel. In the cold winter, the bath warms the body and in the highly humid summer, it washes away the constant stream of perspiration. The bath is indispensable to Japanese life. It is the optimum cure for a day's fatigue. Because today the majority of Japanese homes have baths and many kinds of bathing remedies are being sold, there is an increase in the number of people who enjoy their baths by adding their favourite bathing remedy to the water.